Personally, I never liked the idea of Digital Distribution until one day I saw a talk at UC Berkeley by John Riccitiello, CEO of Electronic Arts at the time. I have no idea what the point of the talk was but you can bet I was sitting in the front row. The way Riccitiello explained it made me realize that it was in fact the future of gaming. In gaming, it basically means you buy the rights to play a game rather than a disc. A lot of people don't like the idea of digital distribution because they feel uneasy of the fact you just can't hold the game. You sorta just have to trust the gaming company from which you bought it will give you access to it when ever you want. There's many reasons why a lot of people don't like this new medium, but I believe it's here to stay. Here are 7 reasons why. Gaming companies wont have to worry about paying to create millions of discs, disc boxes, and game manuals. They also wont have to worry about paying to distribute these physical copies to stores all around the world. The only physical work required after a game is completed is to flip the switch to allow consumers to buy it directly from their consoles. You know what this means, you'll be getting games even faster now; no waiting around for manufacturing or distribution. Unfortunately for GameStop and other retailers, we wont need them anymore. Not having to go to a store to buy a game means you can download it at exactly midnight and be ready to play even faster. Depending on your internet download speed of course... but not really--they could actually fix this up with some code. It would be possible to let you download the game before it's official release, behind the scenes and then you would play it instantly upon its official release. You also don't have to worry about whether the store is open or not. You could download The Evil Within at exactly 3:00 am if you so please. Without physical copies to rip, hackers would have a harder time trying to pirate games when it would all be encoded within the system. Even when people figure out how to get their hands on the files of a game, it would still be harder to make illegal copies. And even when you manage to do it, success would be short lived since it would be patched practically overnight. All this makes developers sleep at ease knowing they aren't wasting their time making games just so people can play them for free. Having no used games means developers will always earn income from every game sold. Currently, if you buy a used game at GameStop, the only one who profits is GameStop. 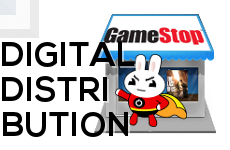 Luckily GameStop wont be able to rip off anyone anymore because there will be nothing they can "buy" from people. Never again do you have to say goodbye to any of your games. Keep your gaming collection for EVER! The great thing about all the cut costs is that consumers will get to see the savings themselves too. Right now Warner Bros. has The Humble WB Games Bundle where they let you pay whatever you want for some of their best games. How are they able to do this without going bankrupt? Well it's simple, the games are distributed to the consumer through Steam. Warner Bros. sees no manufacturing or distribution costs so they are able to easily bring you this amazing Humble Bundle that also just so happens to support charity. You have nothing physical to accidentally break. When I was younger this was a real problem, the discs would get scratched so easily and then of course, stop working all together. Once the disc is broken, your game is gone for good. With a digital copy, there's no such thing as scratches. Even if your content gets corrupted, you can just delete it and download it again. No problem. It would be foolish to believe things could turn out any other way. Music was the first to go, followed by books, and now it's videogames starring down that cliff. It can be scary but you gotta believe, it's not the end. No matter what anyone says or tries to do to hold it back, you just can't stop it.